Dry mounting is the process in which photos or other artwork are heated in a press and bonded to a substrate using an activated adhesive. You have the choice between archival or plain adhesive depending on the value of your print. it is not intended for original art. Most creases, tears and wrinkles can be repaired to satisfaction. Dry mounting is a way to keep artwork stiff so that it can be framed. Posters, photos and other art begin to look wrinkled over time if they have not been mounted properly – keep them safe using dry mounting. 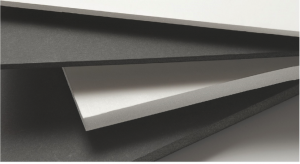 We mount to different substrates including: Foamcore, Archival Foamcore, Gatorfoam, Sintra, Styrene, and Hardboard. Dry mounting is also a fast and economical way to show presentation materials.